One of the main blockades for the actual shift to Open Science is that most people, even within the Open Science community, operate in separate silos. In order to overcome this, we need other formats than presentations and panels. 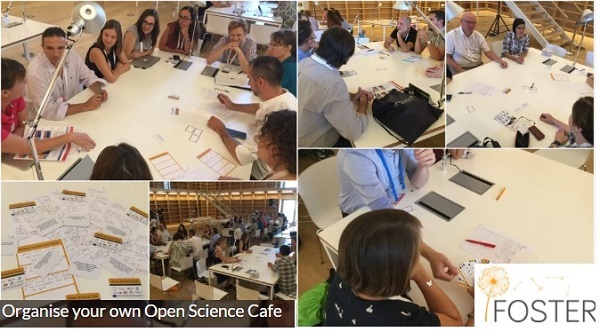 Open Science Cafes do have the potential to connect different stakeholders, as they facilitate listening and sharing thoughts. In short, Open Science Cafes consist of roundtable conversations that are ignited by statements on a set of cards. You can use the cards in different ways. This FOSTER online manual (also downloadable as pdf) describes the format that was used at the Open Science Fair in Athens in September 2017.